Not much action on Cable these days so I’ve decided to book my profits for now. Here’s how my pullback short trade turned out. Before reading on, make sure you’ve reviewed my initial GBP/USD idea and my fundamental and technical reasons for shorting. As seen on the pair’s chart below, price resumed its drop after retracing to the 38.2% Fib level, which was right where I was able to enter. I’ve mentioned in my trade idea that I was considering an STA strategy for this one in case bearish momentum strengthens so I added another position at 1.3390 but only at a fraction of my initial 0.50% risk. Price seemed ready to make new lows soon after, but world leaders continued to reassure the markets in the days that followed, leading to a rebound in equities and other higher-yielders. To top it off, the promise of additional stimulus from major central banks appears to have eased global growth slowdown concerns stemming from a Brexit. Because of that, I’ve decided to close early when price edged slightly past my second entry point. In retrospect, however, I wish I had waited for BOE Governor Carney’s speech later that week because he confirmed that the UK central would ramp up its easing efforts. 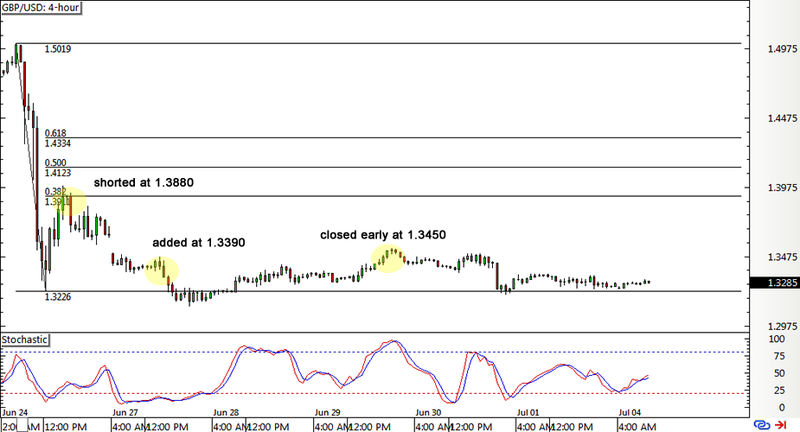 That way, I might’ve been able to close at a much better price closer to the swing low at 1.3225. Still, a win is a win! I was able to score a 430-pip gain on my first position and gave up 60 pips on my tiny additional position, netting me a 0.57% win on this short trade. What a way to start Q3! I’m still on the lookout for opportunities to short this pair, but I might have to sit on my hands until a decent pullback takes place. As always, remember to never risk more than 1% of a trading account on any single trade. Adjust position sizes accordingly. Create your own ideas and don’t simply follow what I do.